Snapchat isn’t an easy social network to master. It’s riddled with tricky features—even the most social-savvy users aren’t always aware of the capabilities available to them. If you’re using Snapchat for business, there’s a lot to discover beyond the basics and the fun hacks. Even if you’re a seasoned Snapchatter, this guide should offer you some new and useful tricks to better engage your audience on Snapchat. Anyone can add you as a friend on Snapchat if they have your Snapcode—the QR code-like icon we’ve all become familiar with. A personalized Snapcode is a little different because it contains a custom image. Through Snapchat’s website, you can download your Snapcode and dress it up with photo-editing tools like Picmonkey or Canva. The black dots and yellow background make up the the actual scannable code, so anything you alter needs to be within the white ghost area. (It also needs to adhere to Snapchat’s brand guidelines.) 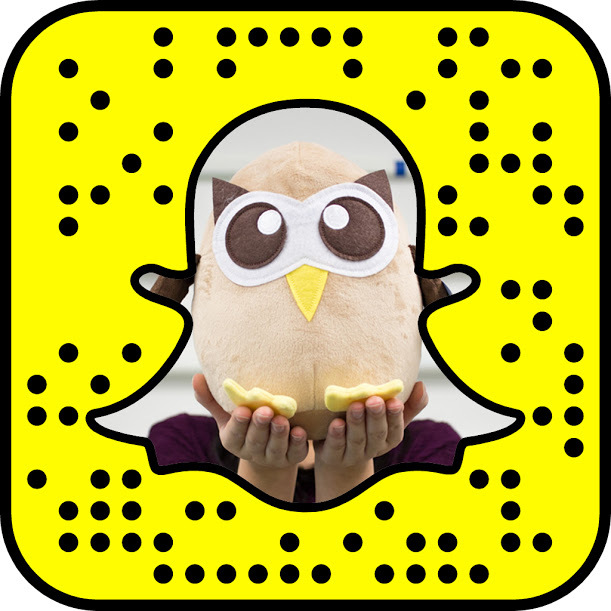 For example, our Snapcode features the recognizable Hootsuite Owly. Snapchat is making paper cool again. With your unique Snapcode you can create printouts for things like key chains and stickers that are scannable. This is a great way to promote your brand during events and make it easy for people to follow you. In addition to sharing your Snapcode, you’ll also want to generate your own custom link to make it easy for people to add you. To get your URL, drag down on the camera view, click ‘add friends’ then ‘share username.’ If someone taps on the link they’ll add you automatically. For increased exposure, share your Snapchat URL in your Instagram and Twitter bios. If you’re looking for more followers, extend your promotion efforts beyond social channels. The Ghostcodes app helps make your Snapchat account more discoverable by the community your brand is associated with. If you run a tourism business, for example, then you can feature your profile under the ‘travel’ category section. You can also add interests so that people who share them can find you. Once you’ve joined Ghostcodes you get ranked by your fellow community with ‘Kudos’ (basically, the social equivalent of a ‘like’). Accounts with the most Kudos rise to the top of the search ranks in Ghostcodes. Wondering how your brand can use Snapchat for customer support? Voice and video calls may be the answer. Until the 2016 updates, the video feature of Snapchat was a bit clunky. Now you can easily make and receive calls in Snapchat. Birchbox, a subscription-based cosmetic company, responded to this feature by hosting open chats with its Snapchat followers. In the summer of 2016, they began an open call session in an ‘Ask me Anything’-style format, where fans could phone in and ask questions about Birchbox. Most callers wanted product tips and recommendations, while others were just curious see if Birchbox would answer the call. If you call a customer on Snapchat and want to leave a message, now you can. Video notes let you insert a video or voice note up to 10-seconds long within a chat. You can create a standalone message or send one after you’ve tried to make a call. Like a GIF, it will play on a loop for users in the chat. To get started, hold down on the phone or video icon to record. Once you lift your finger from the icon, the recording stops. Keep in mind that the recording sends immediately. There is no option to delete or re-record. Snapchat Memories are a way for you to save your Snaps or Stories on Snapchat in the cloud for later viewing. To feature user-generated content, save photos or take screenshots of content that your Snapchat friends send to you in your Memories folder. With that, you can create new brand Stories that feature photos and videos submitted by your followers. Snapchat’s location-based Our Story feature allows people in the same location to contribute Snaps to an ongoing Story. Take, for instance, the digital love story that unfolded at the University of Wisconsin-Madison. A missed connection was announced over Snapchat, and as the two would-be lovers used the app to try and facilitate a real-life meeting, other students from the campus began adding their own snaps to the Story. Brands can follow UW Madison’s example by letting the audience contribute to their stories. To get started, encourage your fans and followers to contribute Snaps during an event or campaign. Geofilters are Snapchat overlays unique to a specific location. You can create your own On-Demand Geofilter for as little as $5, and it’s a great way to build brand awareness or promote an event. Remember, brand Geofilters have different guidelines than personal ones and require approval, so don’t wait until the last minute to create one. You can pick your calendar dates well in advance. To keep your engagement up on Snapchat, you need to post regularly. If you’re willing to experiment a bit, try posting video content at the same time every week in a TV series format. For example, MeUndies creates sketch videos called “Lounge off” on Snapchat, which helps them maintain an average of 80K views per Snap. Chipotle also launched a weekly show on Snapchat called “School of Guac,” a one-minute satirical news show. A Snapchat takeover is a fun way to increase engagement. An effective, and common, way to approach a Snapchat takeover is to choose an industry influencer relevant to your community of followers. We’ve got an in-depth guide that walks you through each step of running a Snapchat takeover. A great way to grow your Snapchat audience and drive sales is to share promotional codes. An early adopter of Snapchat, GrubHub is an expert at offering promo codes and other exclusive offers to its followers. Try rewarding your new friends with a Snapchat-only promo code. Nobody can become an expert overnight, especially on Snapchat. If you follow this guide, you can try out new ideas and tactics that will better engage your audience.